Emma Goldman's pamphlet answering the Trotskyist account of the Kronstadt rebellion. The process of alienating the Russian masses from the Revolution had begun almost immediately after Lenin and his party had ascended to power. Crass discrimination in rations and housing, suppression of every political right, continued persecution and arrests, early became the order of the day. True, the purges undertaken at that time did not include party members, although Communists also helped to fill the prisons and concentration camps. A case in point is the first Labour Opposition whose rank and file were quickly eliminated and their leaders, Shlapnikov sent to the Caucasus for "a rest," and Alexandra Kollontay placed under house arrest. But all the other political opponents, among them Mensheviki, Social Revolutionists, Anarchists, many of the Liberal intelligentsia and workers as well as peasants, were given short shrift in the cellars of the Cheka, or exiled to slow death in distant parts of Russia and Siberia. In other words, Stalin has not originated the theory or methods that have crushed the Russian Revolution and have forged new chains for the Russian people. LEON TROTSKY PROTESTS TOO MUCH. By Emma Goldman. Trotskyists no doubt consider it bourgeois sentimentality to permit the maligned sailors the right to speak for themselves. I insist that this approach to one's opponent is damnable Jesuitism and has done more to disintegrate the whole labour movement than anything else of the "sacred" tactics of Bolshevism. "Our cause is just: we stand for the power of soviets, not parties. We stand for freely elected representatives of the labouring masses. The substitute Soviets manipulated by the Communist Party have always been deaf to our needs and demands; the only reply we have ever received was shooting. . . . . Comrades! They not only deceive you; they deliberately pervert the truth and resort to most despicable defamation. . . . In Kronstadt the whole power is exclusively in the hands of the revolutionary sailors, soldiers and workers--not with counter revolutionists led by some Kozlovsky, as the lying Moscow radio tries to make you believe. . . . Do not delay, comrades! Join us, get in touch with us; demand admission to Kronstadt for your delegates. Only they will tell you the whole truth and will expose the fiendish calumny about Finnish bread and Entente offers. "Long live the revolutionary proletariat and the peasantry!" Leon Trotsky is outraged that people should have revived the Kronstadt "episode" and ask questions about his part. It does not occur to him that those who have come to his defence against his detractor have a right to ask what methods he had employed when he was in power, and how he had dealt with those who did not subscribe to his dictum as gospel truth. Of course it was ridiculous to expect that he would beat his chest and say, "I, too, was but human and made mistakes. I, too, have sinned and have killed my brothers or ordered them to be killed." Only sublime prophets and seers have risen to such heights of courage. Leon Trotsky is certainly not one of them. On the contrary, he continues to claim omnipotence in all his acts and judgments and to call anathema on the heads of anyone who foolishly suggests that the great god Leon Trotsky also has feet of clay. Leon Trotsky quotes Marx as saying, "that it is impossible to judge either parties or people by what they say about themselves." How pathetic that he does not realise how much this applies to him! No man among the able Bolshevik writers has managed to keep himself so much in the foreground or boasted so incessantly of his share in the Russian Revolution and after as Leon Trotsky. By this criterion of his great teacher, one would have to declare all Leon Trotsky's writing to be worthless, which would be nonsense of course. 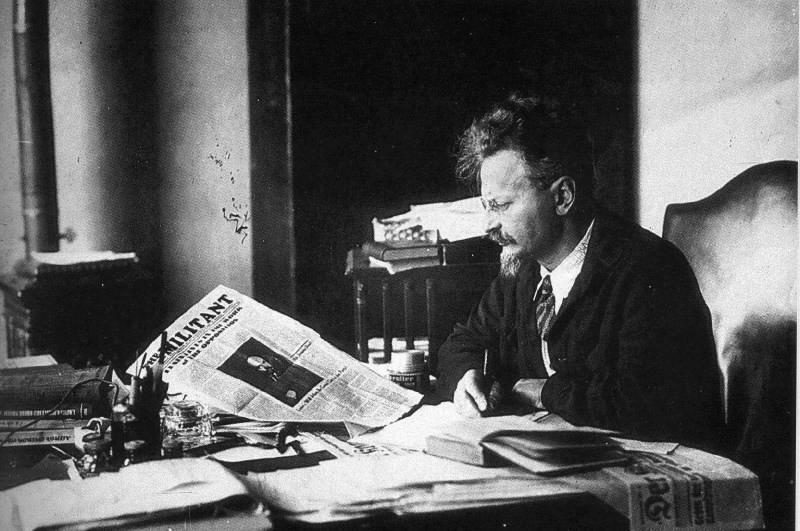 In discrediting the motives which conditioned the Kronstadt uprising, Leon Trotsky records the following: "From different fronts I sent dozens of telegrams about the mobilisation of new 'reliable' detachments from among the Petersburg workers and Baltic fleet sailors, but already in 1918, and in any case not later than 1919, the fronts began to complain that a new contingent of 'Kronstadters' were unsatisfactory, exacting, undisciplined, unreliable in battle and doing more harm than good." Further on, on the same page, Trotsky charges that, "when conditions became very critical in hungry Petrograd the Political Bureau more than once discussed the possibility of securing an 'internal loan' from Kronstadt where a quantity of old provisions still remained, but the delegates of the Petrograd workers answered, 'You will never get anything from them by kindness; they speculate in cloth, coal and bread. At present in Kronstadt every kind of riff-raff has raised its head.'" How very Bolshevik that is, not only to slay one's opponents but also to besmirch their characters. From Marx and Engels, Lenin, Trotsky to Stalin, this methods has ever been the same. Now, I do not presume to argue what the Kronstadt sailors were in 1918 or 1919. I did not reach Russia until January, 1920. From that time on until Kronstadt was "liquidated" the sailors of the Baltic fleet were held up as the glorious example of valour and unflinching courage. Time on end I was told not only by Anarchists, Mensheviks and social revolutionists, but by many Communists, that the sailors were the very backbone of the Revolution. On the 1st of May, 1920, during the celebration and the other festivities organised for the first British Labour Mission, the Kronstadt sailors presented a large clear-cut contingent, and were then pointed out as among the great heroes who had saved the Revolution from Kerensky, and Petrograd from Yudenich. During the anniversary of October the sailors were again in the front ranks, and their re-enactment of the taking of the Winter Palace was wildly acclaimed by a packed mass. Is it possible that the leading members of the party, save Leon Trotsky, were unaware of the corruption and the demoralisation of Kronstadt, claimed by him? I do not think so. Moreover, I doubt whether Trotsky himself held this view of the Kronstadt sailors until March, 1921. His story must, therefore, be an afterthought, or is it a rationalisation to justify the senseless "liquidation" of Kronstadt? "The Trubotchny mill workers have gone on strike. In the distribution of winter clothing, they complain, the Communists received undue advantage over the non-partisans. The Government refuses to consider the grievances till the men return to work. "Crowds of strikers gathered in the street near the mills, and soldiers were sent to disperse them. They were Kursanti, Communist youths of the military academy. There was no violence. In point of historic truth, the peasants hated the régime almost from the start, certainly from the moment when Lenin's slogan, "Rob the robbers," was turned into "Rob the peasants for the glory of the Communist Dictatorship." That is why they were in constant ferment against the Bolshevik Dictatorship. A case in point was the uprising of the Karelian Peasants drowned in blood by the Tsarist General Slastchev-Krimsky. If the peasants were so enamoured with the Soviet régime, as Leon Trotsky would have us believe, why was it necessary to rush this terrible man to Karelia. He had fought against the Revolution from its very beginning and had led some of the Wrangel forces in the Crimea. He was guilty of fiendish barbarities to war prisoners and infamous as a maker of pogroms. Now Slastchev-Krimsky recanted and he returned to "his Fatherland." This arch-counter revolutionist and Jew-baiter, together with several Tsarist generals and White Guardists, was received by the Bolsheviki with military honours. No doubt it was just retribution that the anti-Semite had to salute the Jew, Trotsky, his military superior. But to the Revolution and the Russian people the triumphal return of the imperialist was an outrage. Leon Trotsky tells us that the Kronstadt sailors in 1919 would not have given up provisions by "kindness"--not that kindness had been tried at any time. In fact, this word does not exist in Bolshevik lingo. Yet here are these demoralised sailors, the riff-raff speculators, etc., siding with the city proletariat in 1921, and their first demand is for equalisation of rations. What villains these Kronstadters were, really! Both writers make a mountain of a molehill of the rumours announced at the meeting of 1st March to the effect that a truckload of soldiers heavily armed were on their way to Kronstadt. Wright has evidently never lived under an air-tight dictatorship. I have. When every channel of human contact is closed, when every thought is thrown back on itself and expression stifled, then rumours rise like mushrooms from the ground and grow into terrifying dimensions. Besides, truckloads of soldiers and Chekists armed to their very teeth tearing along the streets in the day, throwing out their nets at night and dragging their human haul to the Cheka, was a frequent sight in Petrograd and Moscow during the time when I was there. In the tension of the meeting after Kuzmin's threatening speech, it was perfectly natural for rumours to be given credence. "Many of those wounded in the attack on Kronstadt had been brought to the same hospital, mostly Kursanti. I had an opportunity to speak to one of them. His physical suffering, he said, was nothing as compared with his mental agony. Too late he had realised that he had been duped by the cry of 'counter-revolution.' No Tsarist generals, no White Guardists in Kronstadt had led the sailors--he found only his own comrades, sailors, soldiers and workers, who had heroically fought for the Revolution." No one at all in his senses will see any similarity between the N.E.P. and the demand of the Kronstadt sailors for the right of free exchange of products. The N.E.P. came to reintroduce the grave evils the Russian Revolution had attempted to eradicate. The free exchange of products between the workers and the peasants, between the city and the country, embodied the very raison d'etre of the Revolution. Naturally "the Anarchists were against the N.E.P." But free exchange, as Zinoviev had told me in 1920, "is out of our plan of centralisation." Poor Zinoviev could not possibly imagine what a horrible ogre the centralisation of power would become. It is the id"še fixe of centralisation of the dictatorship which early began to divide the city and the village, the workers and the peasants, not, as Leon Trotsky will have it, because "the one is proletarian . . . . . and the other petty bourgeois," but because the dictatorship had paralysed the initiative of both the city proletariat and the peasantry. "Many arrests are taking place. Groups of strikers guarded by Chekists on the way to prison are a common sight. There is great nervous tension in the city. Elaborate precautions have been taken to protect the Government institution. Machine guns are placed on the Astoria, the living quarters of Zinoviev and other prominent Bolsheviki. Official proclamations commanding immediate return of the strikers to the factories . . . . and warning the populace against congregating in the streets. "The Committee of Defence has initiated a 'clean-up of the city.' Many workers suspected of sympathising with Kronstadt have been placed under arrest. All Petrograd sailors and part of the garrison thought to be 'untrustworthy' have been ordered to distant points, while the families of Kronstadt sailors living in Petrograd are held as hostages. The Committee of Defence notified Kronstadt that 'the prisoners are kept as pledges' for the safety of the Commissar of the Baltic Fleet, N. N. Kuzmin, the Chairman of the Kronstadt Soviet, T. Vassiliev, and other Communists. If the least harm is suffered by our comrades the hostages will pay with their lives." Under these iron-clad rules it was physically impossible for the workers of Petrograd to ally themselves with Kronstadt, especially as not one word of the manifestoes issued by the sailors in their paper was permitted to penetrate to the workers in Petrograd. In other words, Leon Trotsky deliberately falsifies the facts. The workers would certainly have sided with the sailors because they knew that they were not mutineers or counter-revolutionists, but that they had taken a stand with the workers as their comrades had done as long ago as 1905, and March and October, 1917. It is therefore a grossly criminal and conscious libel on the memory of the Kronstadt sailors. In the New International on page 106, second column, Trotsky assures his readers that no one "we may say in passing, bothered in those days about the Anarchists." That unfortunately does not tally with the incessant persecution of Anarchists which began in 1918, when Leon Trotsky liquidated the Anarchist headquarters in Moscow with machine guns. At that time the process of elimination of the Anarchists began. Even now so many years later, the concentration camps of the Soviet Government are full of the Anarchists who remained alive. Actually before the Kronstadt uprising, in fact in October 1920, when Leon Trotsky again had changed his mind about Machno, because he needed his help and his army to liquidate Wrangel, and when he consented to the Anarchist Conference in Kharkhov, several hundred Anarchists were drawn into a net and despatched to the Boutirka prison where they were kept without any charge until April, 1921, when they, together with other Left politicals, were forcibly removed in the dead of night and secretly sent to various prisons and concentration camps in Russia and Siberia. But that is a page of Soviet history of its own. What is to the point in this instance is that the Anarchists must have been thought of very much, else there would have been no reason to arrest them and ship them in the old Tsarist way to distant parts of Russia and Siberia. Leon Trotsky tries a trump card, when he asks, "Where and when were their great principles confirmed, in practice at least partially, at least in tendency?" This card, like all others he has already played in his life, will not win him the game. In point of fact Anarchist principles in practice and tendency have been confirmed in Spain. I agree, only partially. How could that be otherwise with all the forces conspiring against the Spanish Revolution? The constructive work undertaken by the National Confederation of Labour (the C.N.T. ), and the Anarchist Federation of Iberia (the F.A.I. ), is something never thought of by the Bolshevik régime in all the years of its power, and yet the collectivisation of the industries and the land stand out as the greatest achievement of any revolutionary period. Moreover, even if Franco should win, and the Spanish Anarchists be exterminated, the work they have started will continue to live. Anarchist principles and tendencies are so deeply rooted in Spanish soil that they cannot be eradicated.